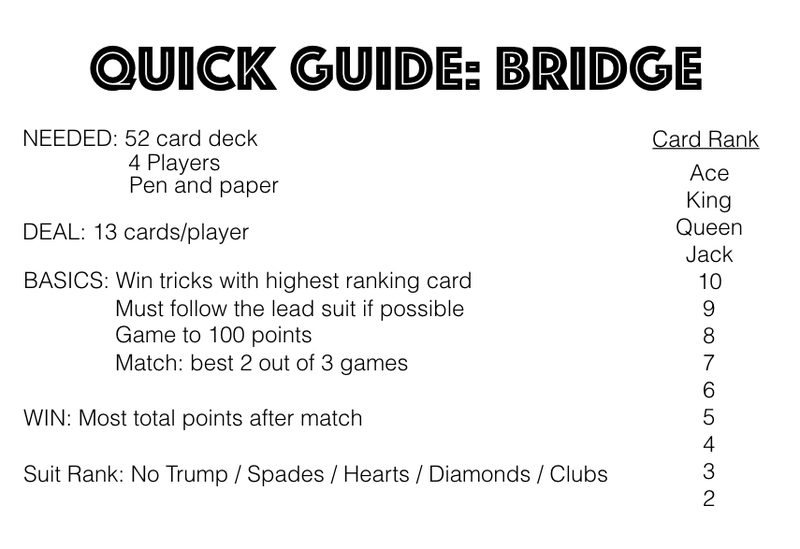 Bridge is an advanced trick-taking card game. Partners need to be in sync to win this strategic game. You will find the video tutorial and explanation for contract bridge below. Also, be sure to check out the quick guide and scoring guide to help you learn as you play. Deal: Each player is dealt 13 cards, one at a time. Card Rank: Highest to lowest – Ace, King, Queen, Jack, 10, 9, 8, 7, 6, 5, 4, 3, 2. The trump suited cards will outrank all other suited cards. Bidding: The dealer is first to bid or can pass on bidding. When bidding, a player will announce how many tricks his/her team will win over 6 tricks, and what suit he/she wants trump to be. A bid of 1 heart means a team needs to take 7 tricks and wants hearts as the trump suit. Each bid going forward has be higher than the previous bid. A player can bid the same number of tricks in a higher suit, or bid more tricks in any suit. A no trump bid means during the round no suit is considered trump. A player that has passed previously can still make a bid next time around. A bid is only won when it is followed by 3 consecutive passes. The winner of the bid is known as the declarer. Game Play: The player left of the declarer leads the first trick. Once the first card is played, the declarer’s partner will lay down his/her hand for everyone to see. These cards are known as the dummy hand for the round. During the round the declarer will play for his/her partner, as well as from his/her own hand. Every player is required to play a card in the same suit as the first card played whenever possible. If a player does not have a card in the lead suit, he/she can play any card. The winner of the trick is the player with the highest ranking trump suited card. If no trump suited card was played, the winner of the trick is the player with the highest ranking card in the lead suit. One player from each team should collect the tricks won by the team. At the end of the round each team’s tricks are counted. Scoring: There are many aspects to scoring bridge. Check out the scoring quick guide to help keep score while you play. The bridge scorecard is setup with 4 areas. The left side is for one team and the right side is for the other team. The top areas are for bonus scores, and the bottom areas are for scoring the tricks bid. Each trick over 6 tricks that a team wins is worth points. When diamonds or clubs are trump, each trick is worth 20 points. When spades or hearts are trump, each trick is worth 30 points. When no trump is called, the first trick over 6 tricks is worth 40 points, each additional trick is worth 30 points. A game of bridge is won by winning 100 or more points. This can be done in one hand, or may take multiple hands. Once a team gets 100 or more points, a line is drawn under the score to indicate a game has been won. A match of Bridge is played as a best 2 out of 3 games. Once a team has won 2 games, the match is over. 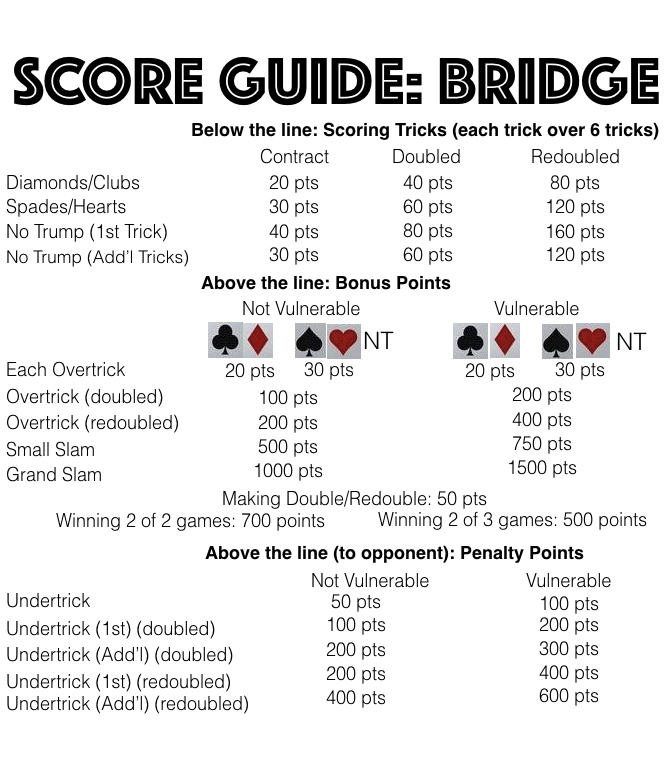 Bonus points: During a bridge match there are a number of bonus points and penalties that can be scored. All bonus points and penalties are marked above the middle line on the score sheet. When a team wins more tricks than they bid, each additional trick is worth additional points depending on the trump suit. Each additional trick when diamonds or clubs were trump is worth 20 points each. When spades, hearts, or no trump was called, each additional trick won is worth 30 points. If a team wins the bridge match 2 games to 0 games, the team gets a 700 point bonus above the line. If a team wins the bridge match 2 games to 1 game, the winning team gets a 500 point bonus above the line. Some bonus points and penalties vary depending on your teams status. There are 2 statuses, vulnerable and not vulnerable. Each team begins a match with a not vulnerable status. Once a team wins one game, they get a vulnerable status. A team with a vulnerable status get higher bonus points, and are subject to higher penalties. A team that bids 6 tricks to win 12 tricks in any trump suit or no trump wins a small slam. The team that completes the small slam is awarded bonus points above the line. If the winning team is in a not vulnerable status, the bonus is 500 points. If the winning team is in a vulnerable status, the bonus is 750 points. A team bids 7 tricks to win all 13 tricks in any trump suit or no trump wins a grand slam. The team that completes the grand slam is awarded bonus points above the line. If the winning team is in a not vulnerable status, the bonus is 1000 points. If the winning team is in a vulnerable status, the bonus is 1500 points. A team has to bid the slam in order to get the bonus points. When a team takes less tricks than were bid, a penalty is incurred. When a team is in a not vulnerable status, each undertrick is a 50 point penalty. When a team is in a vulnerable status, each undertrick is a 100 point penalty. The penalty points are scored above the line on the opponent’s side. Once a team has won 2 games the match is over. All the points are totaled from each side. The team with the most points wins the match. Doubling: If a player feels one of his/her opponents has bid too high, he/she can announce “double” which will increase the penalties for not making a bid, but will increase the points awarded if the bid is made. The points are doubled for each trick over 6 tricks won. A team also gets a 50 point bonus on top of the line for making a doubled contract. When doubled, each extra trick taken is now worth 100 points if not vulnerable or 200 points if vulnerable. The penalties are also increased when doubled. For a team that is not vulnerable, the first undertrick is a 100 point penalty, and each additional undertrick is a 200 point penalty. For a team that is vulnerable, the first undertrick is a 200 point penalty, and each additional undertrick is a 300 point penalty. After being doubled, a team can re-double causing all the points and penalties just described to be doubled again. If a new bid is made after a double is announced, the double is cancelled.